Some of the Chinese tourists who visited Birr Castle last week. 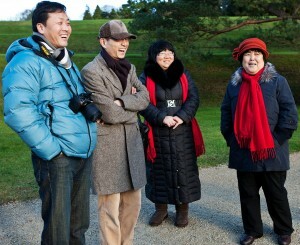 30 January 2012 – A group of Chinese tourists was in Birr last week, ringing in the ‘Year of the Dragon’ Irish-style. During their time here they visited the magnificent Birr Castle demesne. It is estimated that approximately 10,000 Chinese visitors come to Ireland each year. However, Tourism Ireland believes that this market has the potential to grow considerably, especially given China’s strong economy and growing population, which includes an estimated 535,000 ‘high net worth’ individuals. The Chinese tourists visiting Birr last week – from Beijing – had spent a few days in Britain and were able to include Ireland in their itinerary by taking advantage of the visa waiver scheme introduced by the Government last year. The scheme encourages visitors from emerging markets, like China, to visit Ireland when they are visiting the UK, without the hassle or cost of applying for a separate visa. Nine leading Chinese tour operators recently announced they will include Ireland in their 2012 programmes for the first time ever – thanks to the visa waiver scheme as well as improved access from China, including the new Emirates service via Dubai. With the Asia-Pacific region expected to be one of the fastest-growing regions for outbound travel in the next ten years, Tourism Ireland has put a busy promotional programme in place in these emerging markets for 2012. Activity involves co-operative campaigns with airlines and influential tour operators to ensure Ireland features prominently in itineraries and travel brochures; hosting familiarisation visits for Chinese travel agents and tour operators around the island of Ireland; as well as working closely with travel and lifestyle journalists, to ensure the island of Ireland features extensively in the media in China.